Application of information technology in managing educational field got a boost due to the efficiency as well as the effectiveness of the technology. In the primary stage of development, school information management system (SMIS) sole purpose was to bring improvement and efficiency in the activities which are undertaken in school office. Mainly the system was used for storing students and staff data. 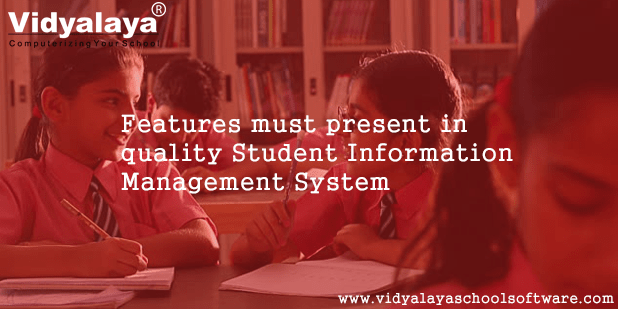 There are some selected features which are must be present in a good information management system designed for the schools. Reputed schools now need to consider performing very activities right in the cloud. The existence of cloud based MIS having no local footprint of any server or software ensures less money and time invested on IT and majorly on important education priorities. There is no need to maintain piles of files for admission management when important data can be stored smartly. The accurate search will make data accessible easily and that can be achieved by systems for student information as well as school software. Selected few school information management system offer accurate accounting functionality. Making Tracking of schools daily expenses, tracking of the fee received and a list of defaulters will make accounting management easier for schools. Recording of the attendance subject wise is must keep a track on the students the students missing the classes and needing the extra class for missed syllabus covered in regular class. It also reduces the chances of proxy and any type of paperwork for attendance records. This feature will help in making communication between individuals and groups. Staff attendance, Salary as well as other expenses can be easily tracked with the support of this management system. Alumnus is the powerhouse for any school and college. It is important to maintain the network of alumnus proactively and need to be simple to handle. Ensure to go for a Student MIS which provides an opportunity to make interaction with Alumni network and help in making discussions on topics like fundraising, programs for membership, social interactions, job boards and donations. The above are some of the key features which need to be present in a good school management system. For adding any customized feature for school-specific needs can be done by discussing with the experts behind the making of the systems for school management. Information system offered by trusted companies provides anytime and anywhere access, in order to ensure that the function remains smooth for the academic process. One of the leading service providers for school MIS is Vidyalayaschoolsoftware.com. You can pay a visit to the website to take details and features of the system offered by the company. Do Your School Management Software Provide 1500+ Reports? I am looking for solution which can help to bridge the gap between parents and teachers obstacles.Can you please suggest any solution ? Sure, we will definitely give the best solution to what your need is.